I haven't met up with you for a couple of weeks, Patrice, so I'm glad to spend some time with you today. Thanks again for posting your great questions, and for getting our conversation started. 1. Who has the most outgoing personality in your family? Hmmm, that's an interesting one. Our four children are so different in personalities. No - let me take that back: the girls are very different from each other, and the girls are very different from the boys. However, the two boys are so similar. The Wee Guy looks just like DR did ten years ago, and for me, it's like having DR all over again. Take, for example, football. Recently he has become obsessed. He goes out to play footie in out back garden - that's fine. He wears his football strips - that's fine. But what is not so fine is that he spews out unending streams of useless information on every jot and tittle concerning football. "Mum, did you know that X cost X million pounds?" Nope. Didn't know. Actually, that went in one ear and out the other, so I still don't know. "Mum, see this player, he's 25, began his professional career with Liverpool; played X games in his first season, and Y games in every season since. He cost blah blah blah"
"Mum, see Team X's stadium - it was built in 1927. Its capacity now is 58,000." It used to be battles. He fought in them, re-enacted them, talked about them, read about them, and yes, spewed out unending streams of information on them. I did see him today combining the two. He was wearing a Rangers strip, but added to it was a helmet, a sword, and some definite fighting moves. Oh, if you're not Scottish, please don't worry about that last conversation. Be happy you are able, with Manuel to say, 'I know nothing'. And Patrice, what was the question? Actually, that wasn't answering your question very well, but I was giving you a flavour of the Wee Guy, and I can tell you that it's like having DR all over again. DR, I think, would be happy to be dropped off anywhere in the world, and he would happily make conversation with anyone he met. Whether Prince or Pauper, he would find an interest in the person, and would soon have invited the person to come and stay with us for a few days. Yes, I think he'd be the most out-going of us all. 2. How did you name your blog? Well, when I decided to blog, my first thought was the phrase No Place Like Home, simply because for me there is no place like home. I then discovered another one or two (or three or four) had thought of that too! I have no idea how the inspiration for Homeschool on the Croft came, though! A moment of genius, maybe. Or simply that we homeschool and live on a croft. That's logical. 3. What's your favourite topping for ice-cream? I never have toppings on ice-cream, but I make an ice-cream, which isn't really ice-cream, so I don't really make ice-cream, but I do make a pudding with whipped cream and broken up meringue, which is frozen so it seems like ice-cream. This is then served with hot chocolate sauce which is made from double cream (heavy cream, I believe it's called across the Pond) and Dairy Milk chocolate. It has to be Dairy Milk. Hot chocolate sauce with this ice-cream-which-is-not-ice-cream .... Yum! 4. Tell me about someone you know who would make a wonderful character for a book. Oh, Big Brother, without a doubt. In this post, he Smiles! Go see for yourself. There are two posts on him shearing his sheep. See Part I here, and then read Part II. And this Delighted to Announce post shows Big Brother, again in his element, though not smiling. Surrounded by his sheep. BB at his happiest. taking a break in the peats, along with the Builder. BB and my two fellas, heading down to get some sheep. My sons, my Builder and Big Brother - probably discussing some deep matter of great historical significance. Or they may have been talking about the weather. So, what do y'all reckon: Would BB make a wonderful character for a book? He also loves the limelight. Ahem. 5. 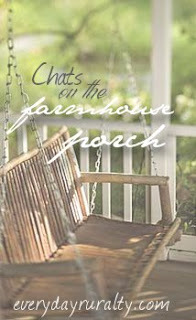 Please tell me up to three questions that you think I should ask on a future farmhouse chat. Oh, Patrice, you know I'm rubbish at these kinds of questions. Let me see ... one question has to be about food - after all, we never tire talking of food. Then a question about politics. Yes! That will get people going. Or maybe not. I am not political myself (excuse me, why did you splutter and choke when I said that, Marina?). For those of you who don't know, Marina is my sister. She knows me, hence her choking splutter. Finally a question on holidays (vacations). Now that we are into February, our conversations are often turning to summer holidays. Hang on ... it's March! Anyway, the fact remains - I am beginning to see a certain son of ours browsing airline websites; I am hearing him say things like, 'I know I said I wouldn't go to America this summer, but ...'. So holidays. Yes, let's make us all smile, either with memories of previous holidays, or with plans for future ones. An unforgettable holiday moment is ____________________________ . There you go, Patrice. These are my suggestions. Oh my that dessert you described sounds delicious. I would request one please, lol. Very handsome men in your family. (I hope you don't mind me saying so) Your post made me laugh a couple of times. It was a good one. :) Enjoy your week! I loved your post, the most entertaining chat.....I think I had two coffees while reading it! I love that you live in a world so different from my own on the other side of the world. Thank you, Cath :) I fancy a cuppa myself now that you mention it - off to boil that kettle! I'm positive that your Wee guy and my Noah would be good friends, and you always make me laugh! That's funny that your youngest is a copy of your oldest. My youngest daughter is a copy of my oldest. We call the oldest "Me" and the youngest "Little Me". I could mix up their baby pictures!Your dessert sounds yummy!Hubby wants to know what kind of sheep BB has. We're rather new to sheep. And yes, Patrice, DR and the Wee Guy are referred to as, 'Me and mini-Me'! Love all of your posts and this one was so interesting.. I always enjoy your pics so much as I would love to visit there..
We are still covered in snow..